The Prices are in Euro per night per house . + Prices: for extra beds. The council tax is 1,5,- Euro per night per person approximately, payable on arrival. For the keeping of dogs/cats a surcharge of 5 Euro per night, and prior consent is necessary. We have the right to change our prices! SI-11 Siófok Apartment with Swimming-pool! 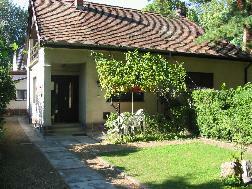 Apartment for 2-4 persons, with 2 rooms, Sat-TV, kitchen, 1 bathroom/WC, balcony 8m2, garden. Park-possibility in the garden. Pet not allowed. 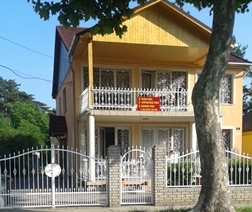 lake approximately 50 m, train line approximately 150 m, restaurant approximately 50 m, shops approximately 50 m, Centrum 150 m.
Apartment-house for 4-6 persons, with 2 rooms, stay-area, Sat-TV, kitchen, 2 bathrooms/WC, safe balcony/terrace, garden, garden-furniture's, garden-grill. Park-possibility in the garden. Pet not allowed. 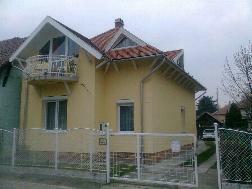 Vacation house for 5 persons, with 2 rooms, kitchen, Bath/WC, Shower/WC, stay-area, Sat-TV, alarm system, garden, garden-furniture's, terrace. Park-possibility in the garden. Pet allowed. 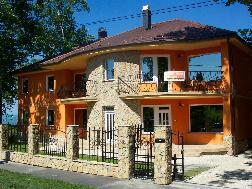 Holiday apartment in Upper-Floor for 2-5 Persons. 1 Room, dining room with SAT TV, kitchen, Bath/WC, Internet, Grill. Possibility of parking in the garden. Single vacation house with 7 rooms, for 10-14 persons, with 5 Shower/5s WC, stay-area, Sat-TV, kitchen, dining rooms, terrace, garden, garden-furniture's, garden-grill. Park-possibility in the garden. Pet allowed. Lake approximately 100 m, train line approximately 250 m, shops approximately 100 m, restaurant approximately 100 m, center approximately 500 m.